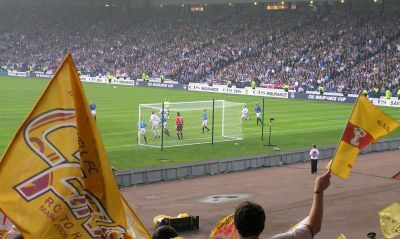 Motherwell were well beaten at Hampden in the CIS Cup final. Terry Butcher summed it up after the game - "We failed to turn up today". Richie Foran got the nod to start the game.He filled the gap created by the cup-tied Jim Hamilton.McDonald was given the job of front man in a 4-5-1 formation but the changed setup did not produce any joy. We did not settle to the task at all well.Nervous defending was evident from the off and we found ourselves in the embarrassing position of being two down inside the first ten minutes. Marshall was caught out of position (not for the only time in the match) in five minutes and Ross’s lob found the net.Before we could regroup Kyrgiakos headed home after O’Donnellfailed to get enough on a clearing header.The big ‘Well support had a perfect view of the early goals but they were silenced by this early reverse. David Partridge gave us hope when he got to the end of a Hammell free kick.For the rest of the half we regrouped and made some attempt at getting back into the game.Had we reached the break only one behind then there might have hope but we conceded a third to a Ricksen free kick.His shot was perfectly aimed but Marshall failed reached it before it crossed the line. Spirits were down in the ‘Well stand at half time.There was talk of damage limitation.The frustrating truth was that we had failed to press the opposition.Space was conceded to easily and Ferguson was given plenty of time and space to deliver telling passes over the top. Novo and Kyrgiakos rubbed salt into our wounds in the second half and the referee’s whistle came as a relief. The team were given an ovation at the end of the game but it was not for the performance on the day.The huge ‘Well support had given loud and enthusiastic support throughout the game but the team failed to rise to our expectations. After the game ‘Well fan Ross Park said, “It was a disaster.To lose by so many goals is a big, big disappointment”. 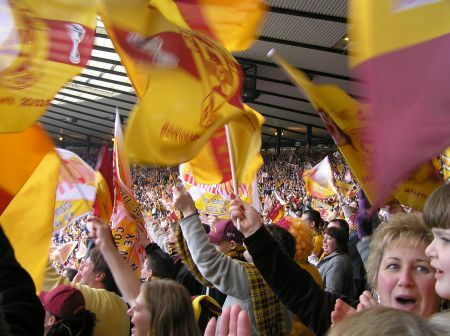 Fortunately our chance for revenge will come at FirPark in a fortnight.Let’s see how we do in our own patch.